Catching a stray dog -- especially a larger one -- requires patience and caution. 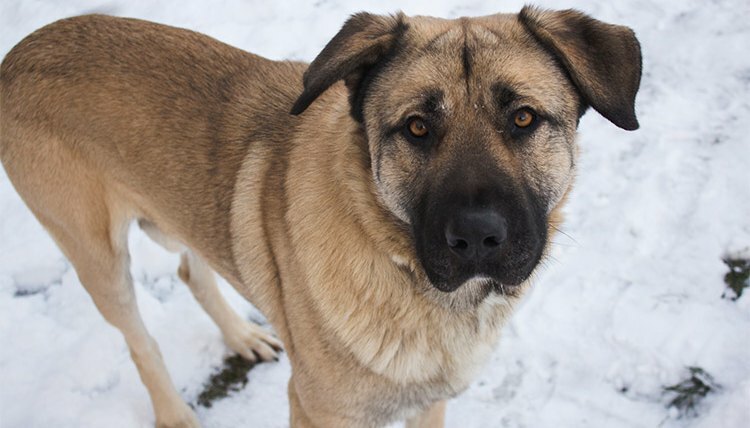 While any stray may have an unpredictable temperament and unforeseen medical issues, large stray dogs are stronger, more difficult to restrain and potentially more dangerous. By approaching the situation with your guard up, and alerting authorities, you can safely catch him while minimizing risk to yourself. Step #1 - Call for help by phoning your local shelter or animal control office to bring in assistance. While smaller dogs are easier to pick up or restrain, large dogs are simply too risky to catch all on your own. Large stray dogs, if frightened or aggressive, can cause serious harm should they attack. Step #2 - Watch the dog out of the corner of your eye. Making direct eye contact while you attempt to catch him may frighten him away. Step #4 - Drop some of the food on the ground. Pick it up, but then drop more food and leave it there, as if you've dropped it without knowing or forgot about it. This attracts the dog even more -- you may need to take a few steps away from the dropped food, so that he perceives an opportunity to approach and take it. While the food you use may be as simple as crunchy potato chips, something more fragrant, like red meat or even wet dog food, which you would only pretend to eat, may be more effective. Step #5 - Kneel or sit on the ground and continue your eating pantomime/food dropping act. Remember not to focus on the dog -- he won't approach if he feels watched. Even large dogs feel more at ease when a creature as tall as yourself is at their level, so stay low to the ground. Step #6 - Wait with the dog for help to arrive. Do not attempt to physically restrain the dog, because large dogs are simply too strong and potentially dangerous to wrangle unassisted. By keeping him busy with dropped food, you ensure that he won't run away before assistance arrives. Once professionals capture and restrain the dog, you and they can determine the best course of action for caring for him. Warning: If the dog displays any signs of aggression, like an unwavering glare, raised hackles, bared teeth or growling, do not attempt to placate or otherwise stay with him. Get to safety and remain there until help arrives.